The Royal Carbineers (Carabinieri Reale) are a paramilitary police force under the direction of the Italian Ministry of Defense (see also this link). They have posts in all Italian cities and towns, and provide the guard of honour to the president of the Italian republic. They also lead on anti-Mafia investigations. Carbinieri have been involved in combat in all military campaigns of Italy since the Napoleonic wars in 1815. They were initially set up as a mounted police force. 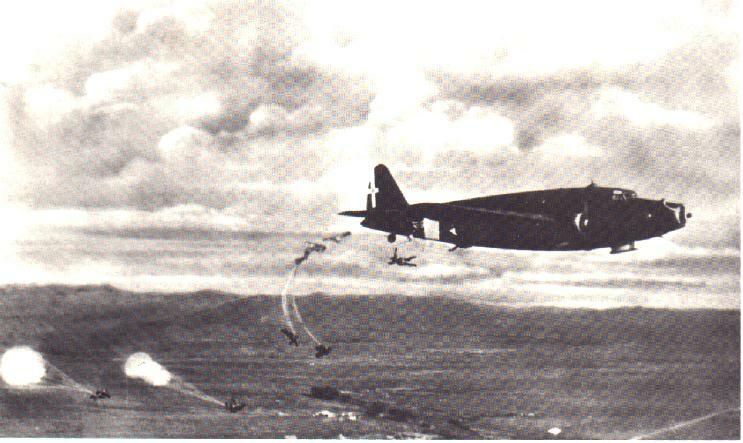 Apart from their military police duty, only one combat unit of Carabinieri was involved in Operation CRUSADER, the 1st Carabinieri Parachute Battalion, which was formed in 1940, and based at the Italian army parachute school in Tarquinia. The battalion had a short but interesting history in North Africa. The following is a translation from the website dedicated to the Carabinieri Parachute arm, www.carabinieriparacadutisti.it. The translation is done with their very kind permission. I have tried to stay true to the Italian original, hence ‘English’ instead of ‘Commonwealth’. The 1st Parachute Regiment is established to incorporate the units of this special branch of the armed forces. The first of the three battalions in the regiment is that of the Carabinieri. At about the same time, the command of the 1st Royal Carabinieri Parachute Battalion passes to Major Edoardo Alessi. Only the Carabinieri Parachute battalion receives the provisional order to depart for North Africa. The carabinieri receive the notice with enthusiasm, even though according to some evidence, this unexpected decision by the Comando Superiori was taken as punishment for some elements less orthodox and respectful towards the regime. Some episodes had in fact possibly led the O.V.R.A., the political police of the fascist regime, to suspect that in the battalion there might be some anti-fascist sentiments: in particular the voices of discontent reported the day after a visit by the Commander of the Army General Staff, General Pietro Badoglio, and finally a parody of a speech by the Duce performed by a second Lieutenant of the Carabinieri Parachutists, named Ragnini, who at the end of a diner on the previous 5 June, given on the occasion of the Carabinieri Day, raised hilarity amongst all those attending, officers of the unit, as well as invited guests, amongst whom also the commander of the Tarquinia School, Colonel Giuseppe Baudoin. While a Carabinieri Replacement Company remains at the school in Tarquinia to replace the expected losses which the unit may suffer in combat, the battalion disembarks in Tripoli. The unit consists of the staff under the command of Lieutenant Max Ambrosi and three companies under the command of Lieutenants Piccini Leopardi, Giuseppe Casini, and Osmano Bonapace. The total strength is 26 officers, 51 NCOs, and 322 attached and Carabinieri. 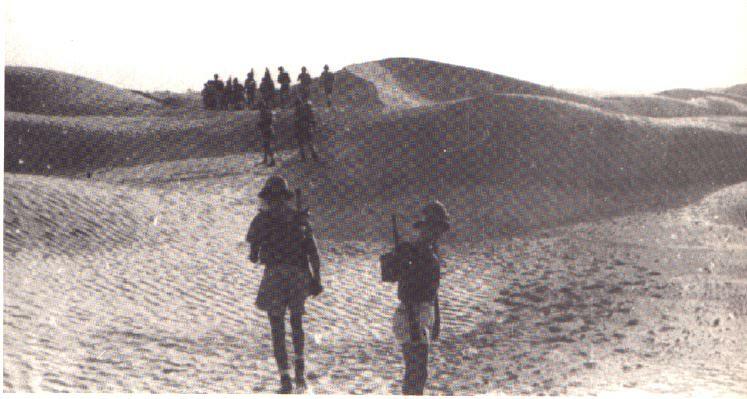 The battalion relocates into the desert by a 30 kilometre march from Zavia to Suani ben Aden. The unit has the task of preventing and repulsing attacks by British commandos. 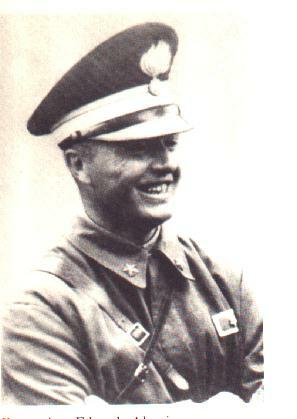 (1) During an air attack on Italian Castel Benito airport the first Carabinieri Parachutist, Antonio Bau, is wounded. On the order by the commander of Panzergruppe Afrika, General Rommel, to Major Eduardo Alessi, the unit reaches the pass of Eluet el Asel, with the task to stop the advance of the British units which, using the roads coming from the inner part of Cyrenaica, intend to cut off the road for the Italian divisions retreating along the Via Balbia. At the end of the battle one platoon of the battalion under the orders of Lieutenant Enrico Mollo, remaining isolated and under pressure, decided not to surrender, but, collecting other dispersed soldiers in the present in the area, and operating behind enemy lines for about 60 days. They protected Italian colonists from Arab attacks, as well as sabotaging military objectives despite the English reaction. Finally, in February 1942, they supported the reconquest of the territory by the Italo-German armed forces. At the end of the battle, apart from the commander, 9 officers, 4 NCOs, and 30 Carabinieri manage to reach Agedabia, from where they are transferred to Sirte. The price paid by the battalion was very high. 31 killed, 37 wounded, and 251 missing. (8) Recognising the numerous acts of valor carried out, in the next years the following medals were awarded: 5 Silver Medals for Military Valor, of which 4 posthumously; 6 Bronze Medals for Military Valor, of which one posthumously; and 4 Crosses for Military Valour. The remnants of the battalion return to Italy and participate in the disbandment ceremony of the unit at the seat of the Territorial Legion in Rome. Two mobile sections were formed on 15 July 1942, one assigned to the Folgore Parachute Division and fighting at Alamein, the other one to the Nembo Parachute Division, and ends up fighting the Germans as part of the reconstituted Folgore combat group after the armistice. On 23 September 1943 Lieutenant Alfredo Sandulli Mercuro, a survivor of Eluet el Asel, is commanding the 27th Carabinieri Section (Military Police) of the Acqui Division on Cefalonia. He is actively encouraging resistance to the German 1st Mountain Division and is illegally sentenced to death and executed. He received a posthumous Gold Medal for Military Valor (see his citation in Italian at this link). Footnotes are written by us, and our responsibility alone, based on our research. They are not from the text on the Carabinieri Paracadutisti website. Attacks by the Long Range Desert Group (L.R.D.G. ), which at the time was engaged in deep penetration activities. Because of the history of the war between Italy and the Senussia, which resisted the Italian occupation and colonialisation until the middle of the 1930s, many settlements had forts or fortified barracks, and many individual forts were dotted along the main tracks in the desert. This could have been in conjunction with the failed Operation FLIPPER, in which ‘L’ Force under Lt.Colonel Laycock attempted to kill or capture Rommel by attacking what was supposed to be his HQ. You can read about this operation at this link. This battle is a battle honour of the Arm of the Carabinieri Reale, as can be seen in their museum in Rome. The battalion fought as part of the Vaiarini Detachment, under the command of Colonel Vaiarini of the Trieste Motorised Division. Anti-tank guns, in this case probably from the Ariete armoured division’s 8th Bersaglieri Regiment. The Libyan Parachutist Battalion was raised by Italo Balbo during his time as governor of Libya, and was the first parachute formation in the Italian Army. It consisted of settlers and natives. Actually 5 Indian Brigade of 4 Indian Division. Many of the missing must have been killed, or gone into hiding. 5 Indian Brigade reported 110 POWs from the action. This entry was posted in Content and tagged carabinieri, Italian Forces, Operation Flipper, retreat. Bookmark the permalink.